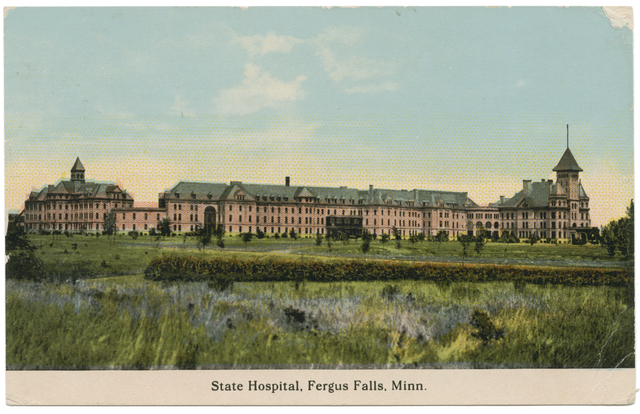 Minnesota established the first hospital for the insane, as it was then known, at St. Peter in 1866. As the population grew, several other hospitals were added, some focusing on particular types of illnesses, disabilities, or age groups. In 1985 several of the state hospitals became regional treatment centers, many offering outpatient services. Over time, more hospitals closed and the state developed a more community-based approach to the care and treatment of the patients formerly housed in these large facilities. This guide is designed to focus on family history research in the state hospital collections. If you are interested in general research into state hospitals, click here. The records that we hold for Minnesota state hospitals include patient records, employee records, and miscellaneous records including administrative, architectural, and general information. Below is a list of state hospitals for which MNHS holds patient and other records. The dates below indicate the time periods for which we have the best individual patient information, NOT dates of operation.